"I would like my picture to look as if a human being had passed between them, like a snail leaving its trail of the human presence... as a snail leaves its slime." 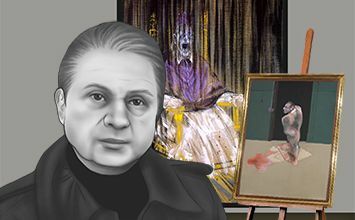 Francis Bacon produced some of the most iconic images of wounded and traumatized humanity in post-war art. Borrowing inspiration from Surrealism, film, photography, and the Old Masters, he forged a distinctive style that made him one of the most widely recognized exponents of figurative art in the 1940s and 1950s. Bacon concentrated his energies on portraiture, often depicting habitues of the bars and clubs of London's Soho neighborhood. His subjects were always portrayed as violently distorted, almost slabs of raw meat, that are isolated souls imprisoned and tormented by existential dilemmas. One of the most successful British painters of the 20th century, Bacon's reputation was elevated further during the "art world's" widespread return to painting in the 1980s, and after his death he became regarded by some as one of the world's most important painters. Bacon's canvases communicate powerful emotions - whole tableaux seem to scream, not just the people depicted on them. This ability to create such powerful statements were foundational for Bacon's unique achievement in painting. Surrealism, and in particular biomorphism, shaped the style of Three Studies for Figures at the Base of a Crucifixion (1944), the work that launched Bacon's reputation when it was exhibited in London in the final weeks of World War II. The work established many of the themes that would occupy the rest of his career, namely humanity's capacity for self-destruction and its fate in an age of global war. Bacon established his mature style in the late 1940s when he evolved his earlier Surrealism into an approach that borrowed from depictions of motion in film and photography, in particular the studies of figures in action produced by the early photographer Eadweard Muybridge. From these Bacon not only pioneered new ways to suggest movement in painting, but to bring painting and photography into a more coherent union. Although Bacon's success rested on his striking approach to figuration, his attitudes toward painting were profoundly traditional. The Old Masters were an important source of inspiration for him, particularly Diego Velazquez's Portrait of Pope Innocent X (c.1650) which Bacon used as the basis for his own famous series of "screaming popes." At a time when many lost faith in painting, Bacon maintained his belief in the importance of the medium, saying of his own working that his own pictures "deserve either the National Gallery or the dustbin, with nothing in between." 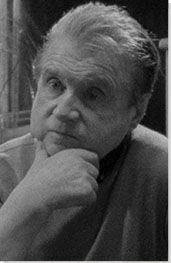 Born in Dublin, Francis Bacon was named after his famous ancestor, the English philosopher and scientist. His father, Edward, served in the army and later took a job in the War Office during World War I. In an interview with critic David Sylvester, Bacon attributed the connotations of violence in his paintings to the turbulent circumstances of his early life. A British regiment was stationed near his childhood home, and he remembered constantly hearing soldiers practicing maneuvers. Naturally, his father's position in the War Office alerted him to the threat of violence at an early age. Returning to Dublin after the war, he came of age amidst the early campaigns of the Irish nationalist movement. Crucifixion is the work that first launched Bacon into the public eye, long before the much greater successes of the post-war years. The painting may have been inspired by Rembrandt's Slaughtered Ox (c.1638), but also by Picasso's Surrealist style perhaps sensing this latter connection, Herbert Read, in his book Art Now, illustrated Bacon's Crucifixion adjacent to a Picasso Bather). The translucent whiteness painted over the bodily frame in Crucifixion adds a ghostly touch to an already unsettling composition, introducing Bacon's obsession with pain and fear. Exhibited at a time when the horrors of the First World War were still remembered, Crucifixion spoke of how brutality had changed the world forever. At the time of writing the picture is owned by Damien Hirst, an artist who has acknowledged a large debt to Bacon. Three Studies launched Bacon's reputation in the mid 1940s and shows the importance of biomorphic Surrealism in forging his early style. Bacon may have originally intended to incorporate the figures in a crucifixion, but his reference to the base of such a composition suggests that he imagined them as part of a predella, the scenes at the bottom of a traditional altarpiece. The twisted bodies are all the more frightening for their vaguely familiar human-like forms, which appear to stretch out toward the viewer in pain and supplication. The perspective lines in the background create a shallow space, alluding to captivity and torture. The figures are based upon the Furies, goddesses of revenge from Greek mythology that play an important role in the Oresteia, a three-part tragedy by Aeschylus. Bacon may have been drawn to the play's themes of guilt and obsession. The piece profoundly influenced images of the body in post-war British art. The layered images of this enigmatic painting blend into each other, giving it a dreamlike (or nightmarish) quality. From the top, the outstretched wings of a bird skeleton seem to be perched upon a hanging carcass, the latter motif influenced, like Bacon's Crucifixion from 1933, by Rembrandt. In the foreground, a well-dressed man under an umbrella sits in a circular enclosure which might be decorated with more bones and another carcass. The strange, collage-like composition of this work reveals Bacon's method. "The one like a butcher's shop, it came to me as an accident," he once said of the picture. "I was attempting to make a bird alighting on a field. And it may have been bound up in some way with the three forms that had gone before, but suddenly the lines that I'd drawn suggested something totally different, and out of this suggestion rose the picture. I had no intention to do this picture; I never thought of it in that way. It was like one continuous accident mounting on top of another." Although the figure in this picture derives from a 1650 portrait of Pope Innocent X by Diego Velazquez, Bacon avoided viewing the original painting, preferring to work from reproductions. Once again, he deploys a cage-like frame that surrounds the pope, but also introduces vertical brushing across the surface of the painting, an element he described as a curtain, relating the figure to a precious object requiring a protected space. However, the linear strokes are destructive to the image, and seem more like the bars of a jail cell. The lines almost seem to vibrate, and complementary shades of purple and yellow add to the tension of the composition. About his famous scream, Bacon says, "I didn't do it in the way that I wanted to.... I wanted to make the mouth, with its beauty of its color and everything, look like one of the sunsets or something of Monet." Bacon's own connections to earlier masterpieces are picked up by the reviewer Mary Abbe who wrote: "[F]or all their nastiness and brutality, there is something undeniably beautiful, even serene in these paintings.. Bacon .. achieved a kind of lyricism that makes even his most horrific subjects compatible with the drawing rooms in which many of them hung. Backgrounds of boudoir pink, persimmon, lilac and aqua combine with the calligraphic grace of his fleshy figures in images of stylized elegance." Due to its homosexual overtones, the inaugural exhibition of Two Figures caused an uproar. Drawn from studies of anatomical drawings and Eadweard Muybridge's motion photography, Two	Figures is as much an exploration of the body in action as it is a representation of the physical act of love. The two figures entwined in bed are covered by Bacon's "curtain" of striated lines, which both obstructs the view and enhances the movement of the figures. Instead of evoking the romance of a nighttime rendezvous, the dark colors of the painting allude to a more sinister encounter. Bacon was in his 60s when he met the young George Dyer. Their relationship, although romantic, always had the sense of a father-son dynamic. Dyer was constantly in need of attention and reassurance, and the naked embryonic form kneeling precariously on a ledge expresses his vulnerability. The circular sofa, however, surrounds him in a protective embrace. Uncharacteristically, the coloring is light and subdued, although the red and green highlights hint at an inner struggle. Dyer suffered from a lifelong addiction to drugs and alcohol, which is alluded to by the painted figure looking downward into a central abyss.